A biography of the silent film–era producer and theater entrepreneur whose name lives on through the major studio he founded. 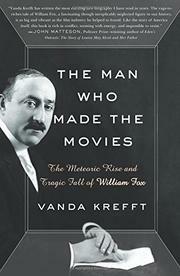 In her ambitious first book, former magazine and newspaper journalist Krefft aims to resurrect the reputation of the pioneering though largely forgotten studio mogul William Fox (1879-1952), whose background story is similar to those of many of the founding fathers of film: tirelessly driven men whose families emigrated from Eastern Europe in the late 19th century. Their stories, including Fox’s, were vividly recounted in Neil Gabler’s An Empire of Their Own (1988). However, unlike many of his Hollywood contemporaries, Fox would maintain his residence in New York, and his contributions were encapsulated within the silent film era. Yet his achievements were significant. He built a multimillion-dollar empire of luxury movie theaters beginning with one small theater in Brooklyn. As a studio head, he had the vision to leverage several new revenue outlets, including the foreign market. He launched the careers of early stars such as Theda Bara and Tom Mix and was responsible for producing a number of highly regarded films, including F.W. Murnau’s Sunrise (1927). In 1929, he suffered a series of disastrous events, beginning with a car accident that summer and the Wall Street crash, which derailed his attempt to merge Fox theaters with Loews releasing company. This would contribute to his losing control of the Fox Film Corporation, leading his career and personal fortune into a downward spiral. Krefft provides an in-depth overview of the early film industry and a lucid assessment of Fox’s role in advancing the technology, art, and business of making films. Though her end goal is ultimately achieved, this hefty narrative is weighed down by excessive details surrounding her subject’s financial dealings. Yet Fox the man remains somewhat elusive. The author’s writing lacks the storytelling verve that a more seasoned film historian like David Thomson brings to his work. An insightful and solidly documented though often ponderous history of the early days of cinema—of primary interest to film scholars.